While they are a large breed, the Irish Wolfhound is actually very timid and sweet. They are calm by nature and make very easy dogs to reside inside the home without any poor behavior issues. They are well mannered around little ones as well as other family pets and eve other canines. They are friendly and even engaging around strangers that may enter the home. 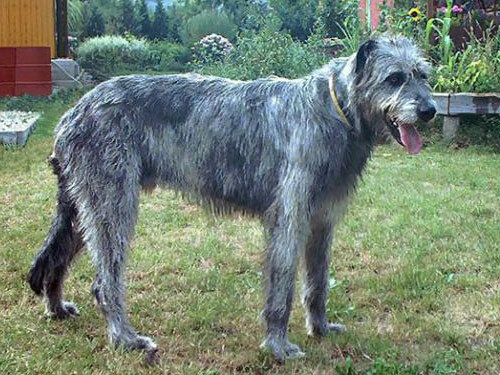 The Irish Wolfhound is a large animal that enjoys a long walk that it will need on a daily basis. Due to their size, they will need a larger home environment to stretch out inside or at least a nice size of a yard to play in daily. They should be given a nice, comfortable and most importantly soft place to sleep and play in and not be left to lie on hard surfaces for too long of periods. When they continue to roam around on harder surfaces, they can develop painful calluses and need a trip to the local vet for treatment. They have a very thick fur coat that will require grooming at least two times per week. This is to prevent dead hairs from making the coat matted and allowing it to trap debris as well. It is recommended to strip any dead hairs from their coating a minimum of two times per year. As far as any major health issue that the Irish Wolfhound can develop, they commonly obtain elbow Dysplasia and gastric torsion. In some cases, they can develop OCD, CHD, cardiomyopathy and osteosarcoma. Rare cases of vWD, PRA and megaesophagus can develop as well. The vet may recommend screening for their hips and heart functions. The average life span of the Irish Wolfhound is between five and seven years long. They are also generally sensitive to barbiturate anesthesia and can commonly suffer from injuries involving the tips of their tails. The average weight is from one hundred to one hundred and twenty pounds as full grown dogs. It is believed the Irish Wolfhound derived from the Ancient Times in Greece. They then traveled to Ireland and were instantly put to use for coursing wolves. They were famous for their large size, but calm tendencies to live as a work dog but also calmly in a home environment as well. They could also aide hunters in finding Irish Elk, which is an unusual craft. Once the eighteenth century evolved, this breed was virtually extinct as they were commonly given to other countries as a gift in packs of seven at one time. They have been known as a successful breed in the show dog circuit, and draws many fans for their large size. They have been given a nod by the AKC with a rating number of 83. They have also been bred in the past with the Scottish Deerhounds and it was around that time frame in the 1870's when they began gaining back their population around the world.